Hey, we can help them find true love by pointing them to GOD, who “so loved the world that He gave His only begotten Son.” That was “the greatest love of all.” And we can point them to JESUS, who first defined and then demonstrated what true love really is. 12 My command is this: Love each other as I have loved you. 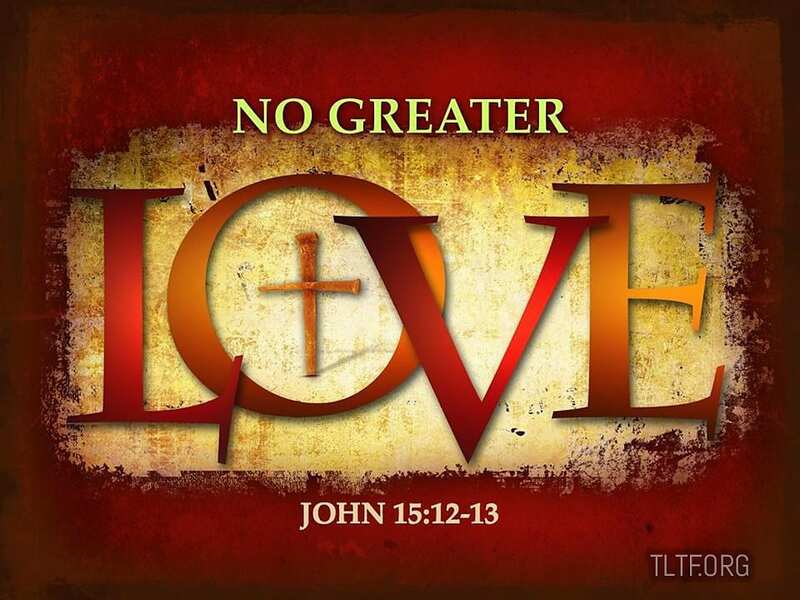 13 Greater love has no one than this:to lay down one’s life for one’s friends. Let me say early on that what I’m sharing in this letter almost makes my knees weak. It seems far beyond my reach, and even as I write I feel guilty for too often falling short in how I have loved people, even those who have truly loved me. So much of this will be in the category of “do what I say, not what I do.” I urge you to read this at least two or three times and ponder it deeply. Despite the claims of some contemporary theology, God’s purpose for us is not to make our lives how we think they should be. His primary desire is that we become like His precious Son, our Lord Jesus, who “learned obedience by the things he suffered” (Heb. 5:8). As the song goes, all people are “standing in the need of love,” but what is “standing in the way of love”? Answer: the SELF-centered sin nature that plagues each of us moment by moment and, when we succumb to its lies, robs of us of the “more abundant life” Jesus spoke of. [The veil is not a beautiful thing, and it is not a thing about which we commonly care to talk. But I am addressing the thirsting souls who are determined to follow God who will not turn back then the way leads temporarily to the blackened hills. The urge of God within them will assure their continuing pursuit. They will face the facts, however unpleasant, and endure the Cross for the joy set before them. So I am bold to name the threads out of which the inner veil is woven. SELF is the opaque veil that hides the face of God from us. It can be removed only in spiritual experience, never by mere instruction. We may as well try to instruct leprosy out of our system. There must be a work of God in destruction before we are free. We must invite the Cross to do its deadly work within us. We must bring our SELF-sins to the Cross for judgment. We must prepare ourselves for an ordeal of suffering in some small measure like that through which our Savior passed when he suffered under Pontius Pilate. Let us remember that when we talk of the rending of the veil, we are speaking in a figure, and the thought of it is poetical, almost pleasant, but in actuality there is nothing pleasant about it. In human experience that veil is made of living spiritual tissue. It is composed of the sentient, quivering stuff of which our whole beings consist, and to touch it is to touch us where we feel pain. To tear it away is to injure us, to hurt us, and to make us bleed. To say otherwise is to make the Cross no Cross and death no death at all. It is never fun to die. To rip through the dear and tender stuff of which life is made can never be anything but deeply painful. Yet that is what the Cross did to Jesus, and it what the Cross would do to every man to set him free. Let us beware of tinkering with our inner life, hoping ourselves to rend the veil. God must do everything for us. Our part is to yield and trust. We must confess, forsake, and repudiate the SELF-life, and then reckon it crucified. But we must be careful to distinguish lazy “acceptance” from the real work of God. We must insist upon the work being done. We dare not rest content with a neat doctrine of self-crucifixion. That is to imitate Saul and spare the best of the sheep and oxen. That sends chills up and down my spine. This is what it means to “reckon the old man dead” so that we can “walk in newness of life.” To lay down our life for another is to focus on Jesus’ interests in that person and act accordingly to help him grow closer to the Lord. When we do, the Lord energizes his presence in our lives and we become more like him. In closing, please consider the following poignant words from Bill Britton in a brief essay titled Dying To Self. [When you are forgotten or neglected or purposely set at naught, and you do not sting or hurt with the insult or the oversight, but your heart is happy, being counted worthy to suffer for your Lord Jesus, that is dying to self. When you lovingly and patiently bear any disorder, any irregularity, any impunctuality, or any annoyance; when you can stand face to face with waste, folly, extravagance, spiritual insensibility—and endure it as the Savior endured, that is dying to self. When you never care to refer to yourself in conversation, or to record your own good works, or seek commendation, and when you can truly love to be unknown, that is dying to self. When you can see your brother prosper and have his needs met, and honestly rejoice with him in spirit and feel no envy or question God, while your own needs are far greater and in desperate circumstance, that is dying to self. Sad to say that my honest answer is “Are you kidding? No way, my SELF-ish sin nature is very much alive,” but I continue to clumsily plod after the sterling example of my Lord and the apostle Paul. 7 But whatever were gains to me I now consider loss for the sake of Christ. 8 What is more, I consider everything a loss because of the surpassing worth of knowing Christ Jesus my Lord, for whose sake I have lost all things. I consider them garbage [dung], that I may gain Christ 9 and be found in him, not having a righteousness of my own that comes from the law, but that which is through faith in Christ—the righteousness that comes from God on the basis of faith. 10 I want to knowChrist—yes, to know the power of his resurrection and participation in his sufferings, becoming like him in his death, 11 and so, somehow, attaining to the resurrection [out] from [among] the dead. This is not a physical resurrection, as is clear when we read verse 12. Furthermore, the Greek preposition ek means “out from among,” which indicates that not everyone will attain this newness of life, which of course is not the case when all Christians are simultaneously raised from the dead. The context (along with other verses like 2 Corinthians 4:10-11) shows that both the aforementioned “death” and “resurrection” are figurative. For Jesus, they were agonizingly, and gloriously, literal, but you and I are called to lay down our lives (die to self) in service to others, and when we do, we experience a “resurrection” of spiritual growth that makes us more like Jesus. As the following verses show, even the apostle Paul had not completely mastered this art of self-sacrifice, so there is hope for us worker bees.